Changing committee chairmanships in Congress and a leadership shakeup at the Federal Communications Commission have once again opened a window of opportunity for comprehensive telecommunications policy reform. While new faces are taking over within Congress and at the FCC, however, old issues continue to dominate the telecom policy landscape. 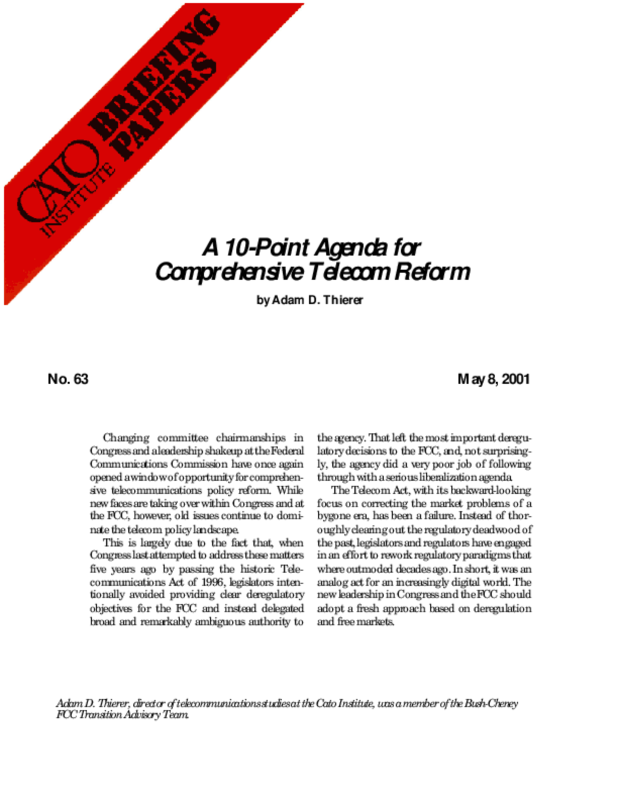 This is largely due to the fact that, when Congress last attempted to address these matters five years ago by passing the historic Telecommunications Act of 1996, legislators intentionally avoided providing clear deregulatory objectives for the FCC and instead delegated broad and remarkably ambiguous authority to the agency. That left the most important deregulatory decisions to the FCC, and, not surprisingly, the agency did a very poor job of following through with a serious liberalization agenda. The Telecom Act, with its backward-looking focus on correcting the market problems of a bygone era, has been a failure. Instead of thoroughly clearing out the regulatory deadwood of the past, legislators and regulators have engaged in an effort to rework regulatory paradigms that where outmoded decades ago. In short, it was an analog act for an increasingly digital world. The new leadership in Congress and the FCC should adopt a fresh approach based on deregulation and free markets.